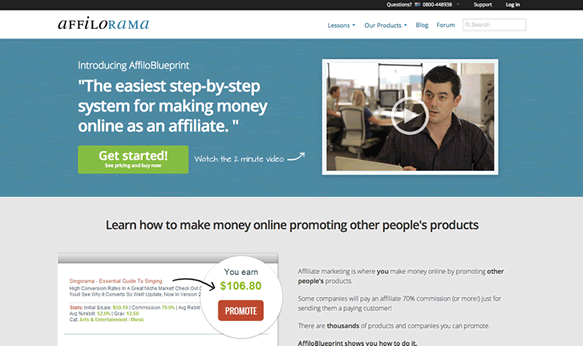 →Affiloblueprint Review: Create successful Affiliate Marketing websites! Today, I’ll be reviewing AffiloBlueprint, the exceptional step-by-step guide to creating an affiliate marketing website that generates huge commissions. It was created by Mark Ling, an 8-figure millionaire affiliate. AffiloBlueprint is exactly what it says it is – a blueprint. It tells you what you need to do, step-by-step guide to creating an affiliate website from scratch. It contains 12 modules. Each module includes over-the-shoulder videos, PDF notes and homework to complete. At the end of the course, you’ll have a finished website that’s pulling traffic to itself and generating sales! Important points to note here! This blueprint takes the confusion and mystery away: new affiliates want to know exactly how millionaire affiliates build their affiliate websites and generate huge commissions. AffiloBlueprint goes step-by-step, with nothing left out – including custom-built wordpress theme, AffiloTheme. Most affiliates who want to create money making successful affiliate websites end up buying lots of tools they don’t need. However, there are lots of free tools out there that drive the same results. AffiloBlueprint teaches you how to use these free tools and get success with them. AffiloBlueprint is great for new and struggling affiliates, who still don’t understand all of the steps involved, and need a blueprint to follow. I went through it, and I can personally tell you that Mark Ling’s formula works. And he has left nothing out – it is all there. Also included is the powerful Affilotheme WordPress theme, which makes creating optimized and highly-converting websites easy. Don’t worry about buying web hosting. This blueprint includes the free Affilotheme hosting for up to 5 websites. This blueprint is all you need to create highly successful affiliate websites that generate huge commissions! It is a complete education: Traffic strategies, market research, site building, and more. Everything you need to know to succeed. If you are an Intermediate affiliates who wants a rinse and repeat system that is proven to work, this is a perfect package for you. While teaching you how to create effective money making affiliate websites, you are earning enough money that will cover the monthly fee. Without Affiloblueprint, you will have to buy lots and lots of products and services, such as web hosting, and SEO tools. All of those things are great – but the monthly expenses add up! However, most of these things can be gotten for free. That’s what this blueprint seeks to teach its members. So you can rank websites in Google using FREE tools and services. In addition, you have free website hosting for up to 5 websites!